Corporate giant, Ansa McAL Trading Limited continued its support of the National Children’s Mashramani Competition with sponsorship to the value of $1.3m in cash and kind. The event is scheduled to be held at the National Cultural Centre on February 14 and 15, 2019. The ceremonial handing-over of the sponsorship cheque was held at the Ministry of Education’s 26 Brickdam office in the presence of Minister of Education, Nicolette Henry; Chief Education Officer, Mr. Marcel Hutson; Administrator of the Unit of Allied Arts, Ms. Lorraine Barker-King; Dance Coordinator of the Unit of Allied Arts, Ms. Shirley Inniss; Business Unit Head of the Non-Alcoholic Division – Ansa McAL, Mr. Errol Nelson and Smalta Marketing Assistant, Ms. Gabrielle Lopes. 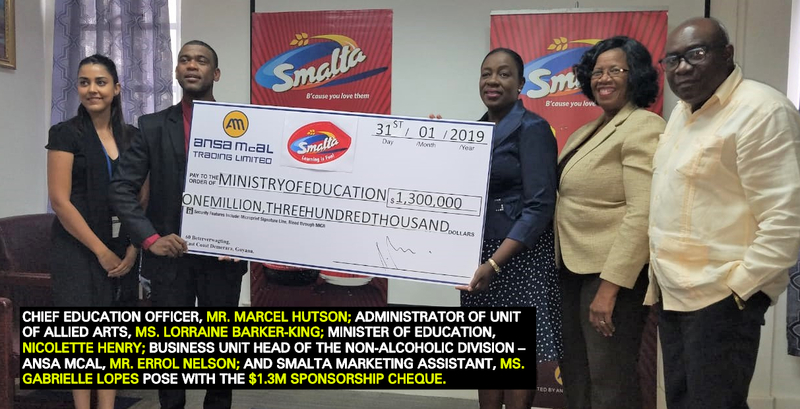 Mr. Nelson said that the Smalta brand is pleased to be a part of the National Children’s Mashramani Competition for the second year having sponsored the event in 2018. “In 2018 we sponsored the event which brought thousands of children from across the various regions with an aim of honouring our corporate social responsibility,” said Mr. Nelson. Further, he described the company’s decision to support the event as being important to supporting the creative and performing arts while motivating the nation’s future leaders to be involved in our culture, “after all, Mashramani is our own unique festival of celebrating after hard-work”. Last year, the company pledged sponsorship totalling one million dollars in cash and kind and this year has increased its initial sponsorship to $1.3M. However, Mr. Nelson noted that there is also a likelihood of the company considering additional support towards individual schools to encourage more participating in Mashramani celebration. Meanwhile, Minister Henry expressed her gratitude to the company for taking its corporate social responsibility seriously. The Education Minister said that she is always pleased when the Ministry can partner and collaborate with other entities to achieve great outcomes. Moreover, Ms. Lorraine Barker-King said that the Ministry of Education is always pleased to collaborate with corporate entities since there is an opportunity to develop, work together and network in a harmonious environment. She said that the sponsorship received today will certainly bode well for both education and the children of Guyana. The Unit of Allied Arts Administrator thanked the company for their support and encouraged them to continue making contributions in the future. The National Children’s Mashramani Competition begins on February 14, 2019 and continues on February 15, 2019 at the National Cultural Centre. On February 16th, 2019 there will be the National Children’s Mashramani Costume Parade in Georgetown starting at Parade Ground and ending in the National Park.